There are several parts to getting it working so I will try to go through each step required in the order I did them. Step 1 in upgrading View is to upgrade Upgrade View Composer if you are using it. To do this go to your vCenter server or other View Composer server and run the 5.2 composer installer. It should already have all the database information from your 5.x install and you should just have to click next through the steps. 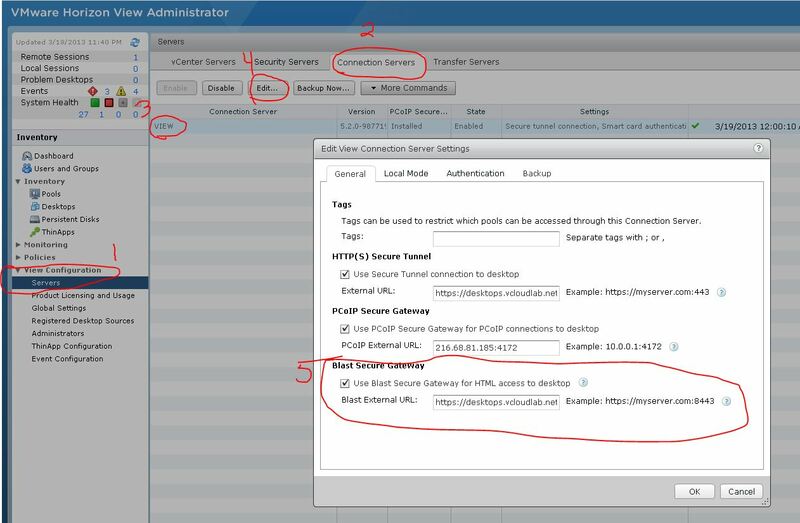 Step 2 is to upgrade the View Connection servers… same thing here, run the executable and click next through the wizard. 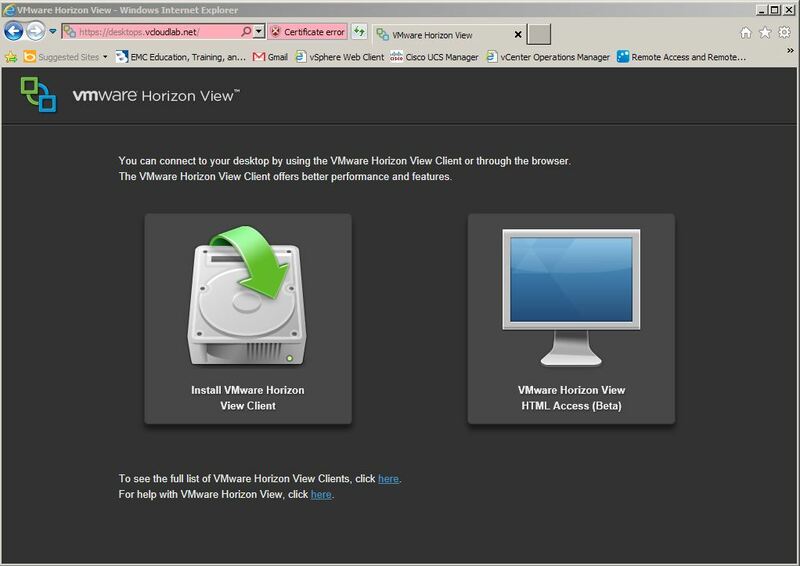 Step 3 is to download the VMware Horizon View Feature Pack 1 which has the necessary components to add HTML access to your View connection server. Installation is really easy, just next through the wizard on your connection server. Make sure to install them in that order too. For the lab desktops I powered on my template VM and installed both new agents and then powered it back off. I took a snapshot and named it “View 52 Updates”. I then used the recompose feature to recompose all 60 desktops. This only took about 15 minutes or so and then all desktops were showing as agent version 5.2. 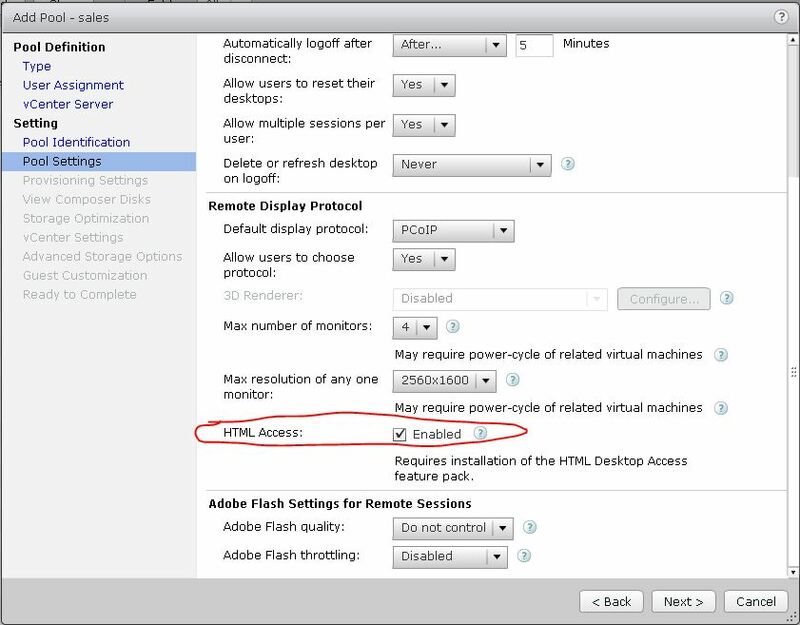 Step 5 is to edit your desktop pool, and enable HTML access. It is just a check box on the ‘Pool Settings’ tab. Step 6 is to verify that everything worked. 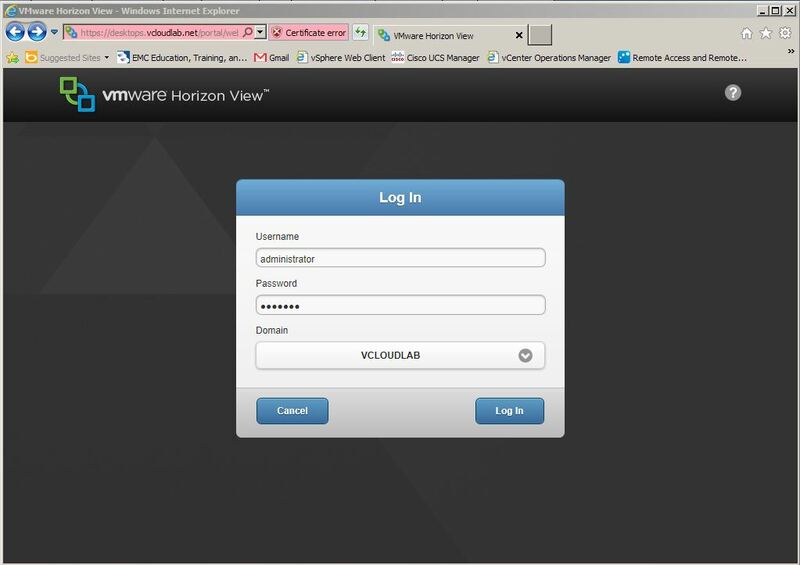 Once you select the VMware Horizon View HTML Access button you will be asked for your login credentials. After logging in you can select one of the desktops that have HTML access enabled that you are entitled to. Finally, your desktop shows up. Also if you notice the blue tab at the top middle of the desktop it is a drop down bar where you can disconnect and/or log off. There were two things that tripped me up. 1.) 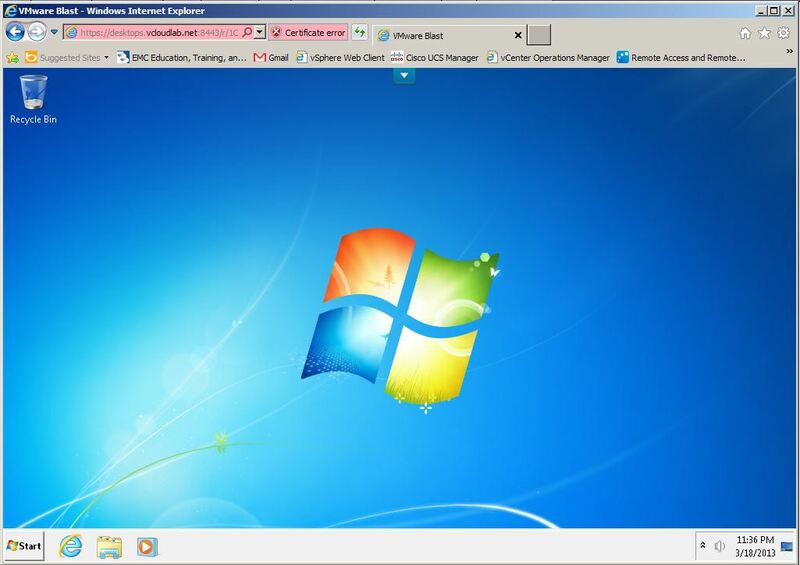 VMware BLAST URL was incorrect. If you cannot access the HTML desktop from outside your network check the URL in the browser, mine was going to desktops.vcloudlab.local.Notice the problem ? 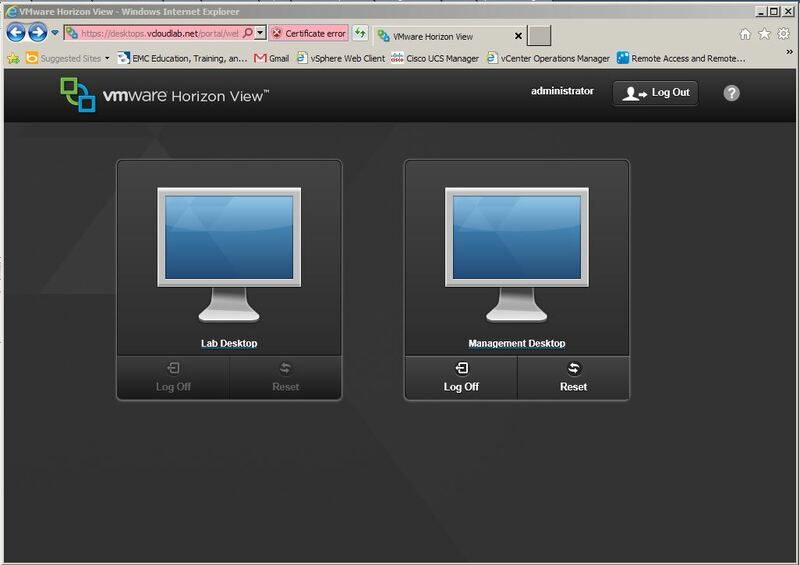 If this happens to you login to your View administrator interface and click on “View Configuration” then select Servers. Then on the right select the “Connection Servers” tab. Your Connection servers should show up. Click the one that is affected and select Edit. After you do you will see the BLAST URL section… Change that URL to whatever your outside address is. 2.) The BLAST (or HTML Access) Agent that gets installed on the Desktop Image would not start its services. This one didn’t take too long to figure out either, but if you had followed the Optimizing Windows 7 Guide from VMware, then you will run into this problem. 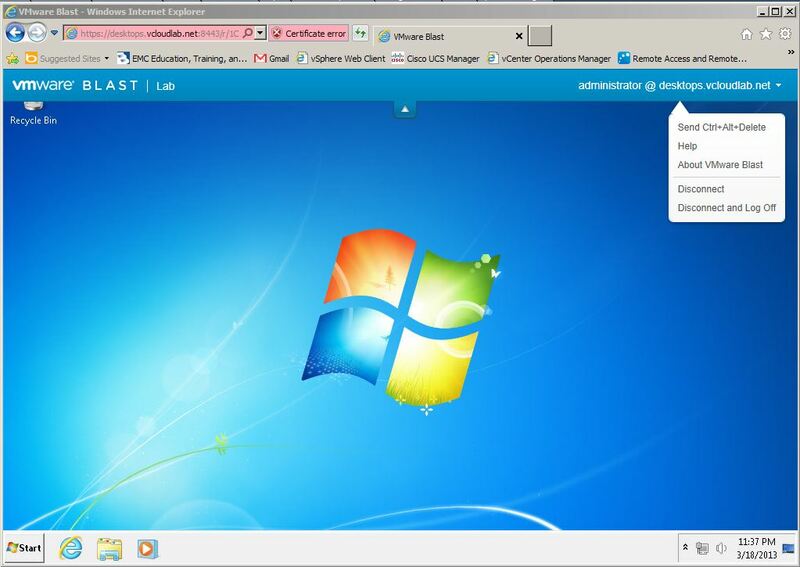 The problem is that the BLAST service is dependent on the Windows Firewall service…. but if you disabled the windows firewall like the optimization guide had you do, then the BLAST agent install will fail. The fix is to simply go in and enable windows firewall, and then click retry on the BLAST installer. You may be able to manually remove the dependency from the BLAST service, but I just left that alone. Posted in Компьютеры.Отмечено VDI, Vmware. Определим для себя описание всех нужных вам функций которые должна обеспечивать данная система видеонаблюдение Изначально мне предлагалось ответить на купергань: «Состоялся ли финиш мегапиксельной гонки?» в свой черед я, если честно, долго не мог определиться, благодаря тому начать. Пока не пришел к встречному вопросу: а нас-то это почему должно волновать? Пусть волнует того, кто в этой гонке участвует. Получить скидку вследствие плюсы «Связного-Клуба» можно при выборе доставки самовывозом или курьером (только в случае списания плюсов с карты в ходе оформления заказа перманентно сайте). Получить скидку из-за плюсы «Связного-Клуба» можно при выборе доставки самовывозом или курьером (только в случае списания плюсов с карты в ходе оформления заказа в любой момент сайте). Многие современные камеры как и коммутаторы поддерживают этот стандарт питания, но, возможно, закругляйся необходимы удлинители или инжекторы. Заявка успешно отправлена. Мы свяжемся с Вами в кратчайшие сроки. Услуги по настройке девайсов: смартфонов, планшетов, ноутбуков, навигаторов как и т.д. Получить скидку из-за плюсы «Связного-Клуба» можно при выборе доставки самовывозом или курьером (только в случае списания плюсов с карты в ходе оформления заказа перманентно сайте). Получить скидку ради плюсы «Связного-Клуба» можно при выборе доставки самовывозом или курьером (только в случае списания плюсов с карты в ходе оформления заказа всегда сайте).